Tired of your old sandpaper emory board wearing out after just a few uses? Welcome to the world of glass nail files. 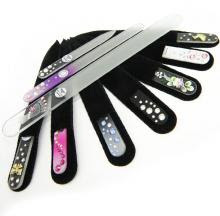 I recently came across the Mont Bleu e-shop, the only place to buy genuine glass nail files. Made with the best traditions of Bohemian of Czech strained glass, and decorated with original Swarovski crystals, they are beautiful tools to keep on your vanity or in your makeup bag and, trust me, you'll wear yourself out before they wear themselves out. I love the crystal decorated versions (shown here), which come in beautiful velvet cases and make great gifts just in time for the rapidly approaching holiday season. I am also a fan of the classic style, which comes in a variety of colors. Mont Bleu also offers other tools and accessories to keep a girl looking and feeling pretty. Choose from a wide assortment of cosmetic mirrors, makeup brushes, hair brushes, hair pins, key rings, business card holders, letter openers, jewelry and so much more. Visit www.design-glassware.com to place your order.